Grand. Glitzy. Old World Glamor. Lunch or Dinner in the Russian Tea Room, founded in 1927 by members of the Russian Imperial Ballet, is a dining experience right out of New York City’s celebrated Gilded Age. A time of elegance, wealth and culture, restaurants were places where the city’s influential cultural, business and political elite gathered for evening-long dining, drinking, socializing and entertainment. They were glamorous places to see and be seen. Located near the cultural touchstone Carnegie Hall, The Russian Tea Room was, and still is, one of these. Today, dining in the Russian Tea Room is a one-of-a-kind immersion into a grander time. The over-the-top ambiance alone makes it an unforgettable experience. Glowing red and gold, and dripping in crystal, top to bottom, it reflects the stunning old world opulence of Imperial Russia, along with influences of edgier modern Russian decor. Sparkling chandeliers, gilded sconces; red wallpaper, flocked and foiled; tufted red leather banquettes, lighted Faberge-style eggs hanging from branches; large bold paintings, sculpture tucked in corners; mirrored walls and mirrored ceilings creating a double time effect. Lunch or dinner, the service is formal and attentive, delivered by a gracious staff, many with distinct Russian accents. The menu is fine Continental cuisine with distinct Russian influences pulled together with a contemporary flavors and presentation. Traditional Russian favorites, Borscht, blintzes, cabbage and caviar weave their way throughout the menu, as do favorites from all parts of the globe: Kobe beef, salmon, Nicoise and Cobb salads, polenta, orzo, foie gras, truffles, crème brulee and tiramisu. 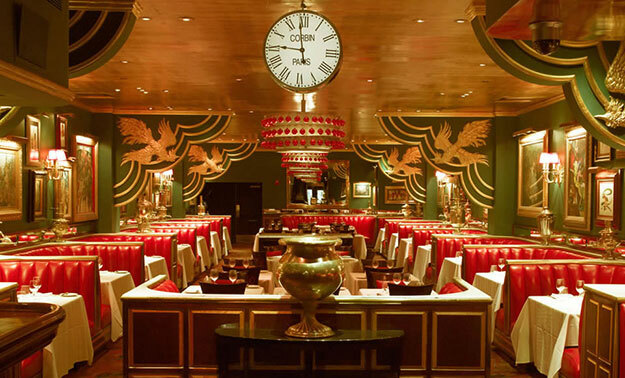 The celebrated Russian Tea Room is a “must do” experience in NYC for visitors from all over the world. Attire varies, coming in all forms of casual for lunch, and with a bit more glam for dinner. But, why not really get into it, lunch or dinner. Play it to the hilt. Dress up for the occasion. For a few hours, enjoy a delightful dining experience in another time, another place. Make time for a leisurely 3-course lunch totally surrounded by opulence. Beets are the “in” root vegetable of today’s trendy culinary world, but they have been a staple in Russian cuisine forever. The Red Borscht, made with pickled beets, is a house specialty. The main course selections range from salad to fish, to beef, all topped, sauced or garnished with mouth-watering, creative combinations. And, the dessert choices? Fabulous. Cocktails and wine not included. In the evening, the Russian Tea Room simply radiates in a golden glow. Dress glamorously. Settle in to the opulent surroundings. Take your time. Choose what sounds perfectly delicious for each of the three courses. The prelude: Borscht, of course, or onion soup, and more. For main course, Beef Stroganoff is a favorite on the deliciously diverse menu. Each entree – fish, beef, chicken, pork, vegetable -is creatively prepared the Continental way with smooth creamy sauces, delicate broths, red wine reductions, flaky puff pastries, and always paired with the perfect accompaniment. Savor each bite. Linger over the dessert – chocolaty, smooth, melt-in-your-mouth delicious.